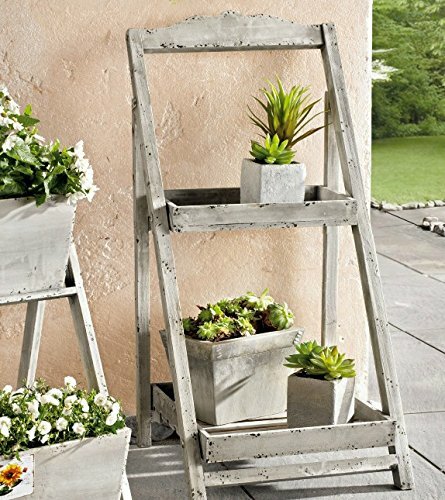 Made for outdoor use, this wooden plant stand features two shelves which will artfully display your potted plants. Try placing it in a sunny corner to grow vegetable starts for your summer garden. Its stable bottom means it will not tip over, and can even straddle uneven ground to securely showcase beautiful plants. This wooden plant stand is perfect for friends who love to garden or people who entertain outdoors. Use: Easy folding design for outdoor use; Material: Wood. Shipping & Shipping Charges: We reserve the rights to choose the final delivery method for items shipping ground. We ship most orders the same day if they're received before 12:00 noon CST. International customers will be responsible for customs duties if any. We will refund the purchase price for any UNUSED item within 30 days of the purchase date. To make a return, please ship the item back with a copy of your receipt. The customer is responsible for all shipping fees unless the mistake was ours. 15% restocking fees may apply, unless it is due to one of the following: Carrier damage; Defective product; Received incorrect product; Product was an extra item not ordered. View More In Pots, Planters & Container Accessories. If you have any questions about this product by PSW - Planter Stands, contact us by completing and submitting the form below. If you are looking for a specif part number, please include it with your message. Hangtec Cylinder HT-1A09 - Stainless steel bracket for hanging baskets, topiary balls, bird feed..